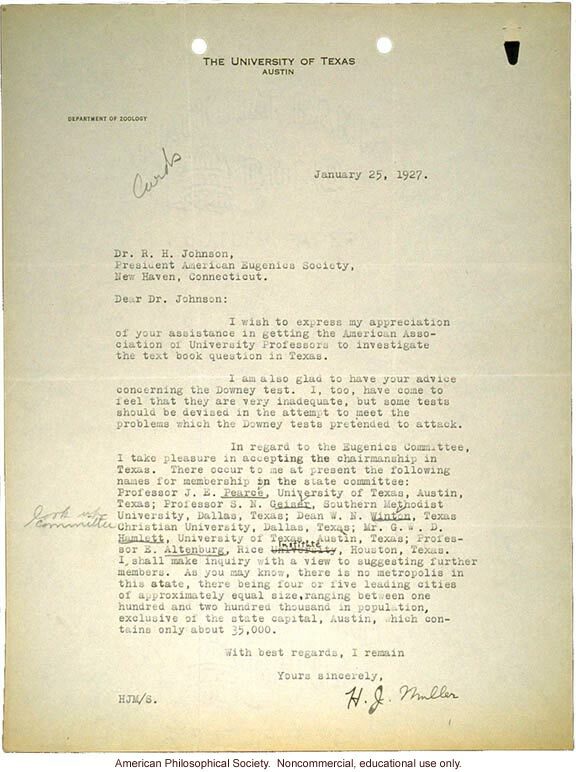 [handwritten note on letter] Cards [and] [illegible] the committee [end handwritten note] THE UNIVERSITY OF TEXAS AUSTIN DEPARTMENT OF ZOOLOGY January 25, 1927. Dr. R. H. Johnson, President American Eugenics Society, New Haven, Connecticut. Dear Dr. Johnson: I wish to express my appreciation of your assistance in getting the American Association of University Professors to investigate the text book question in Texas. I am also glad to have your advice concerning the Downey test. I, too, have come to feel that they are very inadequate, but some tests should be devised in the attempt to meet the problems which the Downey tests pretended to attack. In regard to the Eugenics Committee, I take pleasure in accepting the chairmanship in Texas. There occur to me at present the following names for membership in the state committee. Professor J. E. Pearce, University of Texas, Austin, Texas; Professor S. N. Geiser, Southern Methodist University, Dallas, Texas; Dean W. N. Winton, Texas Christian University, Dallas, Texas; Mr. G. W. D. Hamlett, University of Texas, Austin, Texas; Professor E. Altenburg, Rice [strikeout] University [end strikeout] Institute, Houston, Texas. I shall make inquiry with a view to suggesting further members. As you may know, there is no metropolis in this state, there being four or five leading cities of approximately equal size, ranging between one hundred and two hundred thousand in population, exclusive of the state capital, Austin, which contains only about 35,000. With best regards, I remain Yours sincerely, H. J. Muller HJM/S.